Our host family in Germany live in a small village about 10 kilometres outside Siegen, the main town. Last year the programme was a bit different from the usual as we had more social time with them and we were able to enjoy the beautiful countryside where they live. 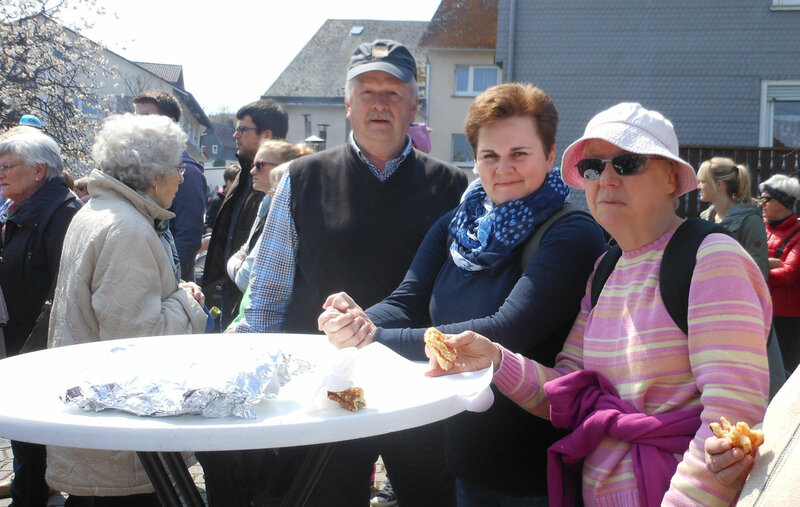 We took part in the 1st May celebrations where it seemed the whole village came out of their homes and gathered together in one street to enjoy potato waffles cooked on open wood-burning stoves in the open air, sold in aid of the local singing group with of course the drinks of your choice. 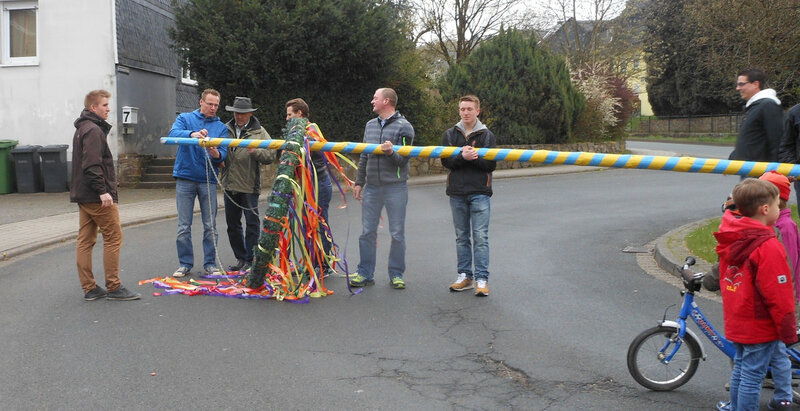 This was after the ceremonial raising of the Maypole the evening before in the rain but with much good cheer. This was just one day. We were there for five, each day different. We all had varied experiences depending on where our host families lived and their interests. Siegerland is a big place. In addition to all this were the organised coach trips, the welcome by the county administrator and the parties. When I sadly and unexpectedly lost my wonderful husband in 1974 and was left with two teenage boys in the middle of their vital education, my local friend suggested that I join her German Exchange Group; I felt that to be a good idea at the time and started by agreeing to put up two ladies in my Mill Hill house. The system ensured that I could go and stay with one of them in their Siegen Home. My two boys were in their late teens and early twenties and I felt they could look after each other for just a week, that it would teach them some extra skills and they got their freedom instead of feeling they had to look after their Mum. This proved a success and I enjoyed a number of years of the two lovely ladies coming to stay here and getting to know them well. We got on so well together, especially as my German language skills are pretty high, until I became too disabled to continue these activities. However, I continued to put up three daughters for the sole purpose of perfecting their English knowledge, which proved exceedingly successful and my younger son was sent to their home in Germany several years running, also to learn all about music recording as the hosts owned a thriving recording business; the other son wanted to go to France, so that was what was organised for him. This friendship has proved highly successful and enjoyable and is as close today as it was so many years ago - in other words, one adds so much by living in a different kind of environment that it adds enormously to ones' life experiences .